The card in the scan is the one you will receive. These costs are your responsibility. 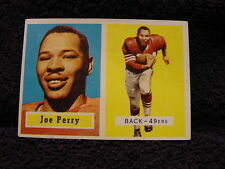 BEAUTIFUL 1957 Topps #129 Joe Perry Card, San Francisco 49ers, VERY NICE! Card is centered 35-65 LR and 65-35 TB with like new color, gloss and focus. Card has very minor corner wear on all four corners. Card is free of any creases. Card's front surface is clean. Card has a very light wax mark on back. Judge for yourself. Any defects will be noted. EX/EX - For commons cards only. Card will be either EX or EX . EX - The best of the Mid Grade cards with centering of 85/15 or better. The corners can have moderate wear, but no major flaws. Great value for the money. This card is in VG/EX condition, no creases. 1951 BOWMAN JOE PERRY #105. Card # 114. Cards will be securely protected in a penny sleeve, put in semi-rigid plastic saver. This card is Very good to very good excellent. All corners sharp with slight touch of wear showing. Centering 80/20 and with no creases. CONDITION: VERY GOOD-EXCELLENT (MC-OC) OR VERY GOOD. VERY LITTLE CORNER WEAR. NO CREASES EXCEPT FOR A LIGHT CREASE ON BACK CORNER. We give our honest opinion. CONDITION: VERY GOOD. HAS CREASE AT LEFT SIDE. BUT NO OTHER CREASES. We give our honest opinion. 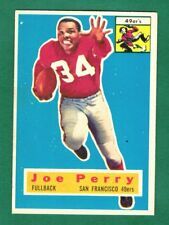 1956 Topps Football Card, #110, Joe Perry, San Francisco 49er's, EX! 1950 Bowman Football Joe Perry RC (HOF) #35 - SGC 60 5 EX NICE SHARP CARD! !